Give the San Francisco 49ers credit. The moment Santa Clara voters passed Measure J and approved their new $937 million South Bay stadium, the team posted snazzy on line sneak previews and artist's renderings of every aspect of the beautiful new stadium. Now give the 49ers some grief. The site is a slow-loading Flash disaster with some moronically unrealistic Photoshop jobs and the way too-loud voice narration of Jed York. The site should be of note to Raider fans as well, because if this thing is built as planned, there is a good chance it will the home field for the Silver and Black. So click if you dare on 49ersNewStadium.com, the on line preview of the ultramodern new stadium and all its high-tech amenities. The site also explains how fans can get onto the waiting list for tickets to 49ers games at the new Santa Clara stadium. The site's home page will take forever to load. Each single page individually will take forever to load. But while you wait, you get a cool animated status bar and what sounds like some background music from a satanic possession horror movie to keep you entertained. If you're an excited South Bay Niner fan, you'll be geeked at the high-resolution artist's renderings of what's to come in 2014. The living "green roof" with a view of the mountains and the luxury suites look absolutely stunning. 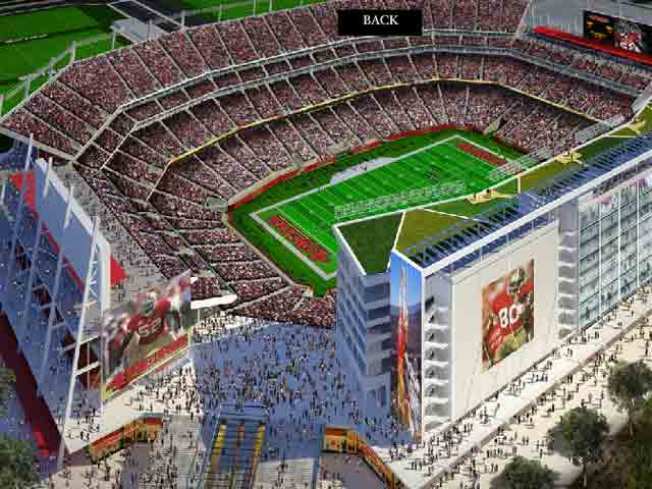 But in some of the renderings, you can actually see through the 49er fans as if they were ghosts. Who's going to buy season tickets if they think the place is haunted? In another artist's rendering, 49ers are simply walking off the field and straight into the stadium's buffet restaurants and bars. You've got to hope the team is going to approach the games a little more competitively than that. Fans who want to get on the waiting list for season tickets at the new Santa Clara stadium are now being offered that option. "Waiting list" basically means "Buy a season ticket at the crappy current stadium which is not pictured here". If you don't want to buy season tickets for Candlestick Park, you can otherwise pay a $100 per-seat non-refundable deposit to reserve a place on the wait list. You will not be guaranteed to actually get a season ticket. You will not be guaranteed any kind of choice of seating. You will not be guaranteed that the stadium will be complete by 2014, nor will you be a given a certain date of when the 49ers actually will begin playing their games there. In other words, by that time you might be one of those see-through ghost people. Joe Kukura is a freelance writer who appreciates that the chicks all look like hippies in the artist's rendering of the stadium's "green roof".